Plongez dans une immersion intensive dans la culture chinoise sans rencontrer de problèmes de transport, dans cette excursion d’une journée bien remplie qui constitue une introduction parfaite à Pékin. 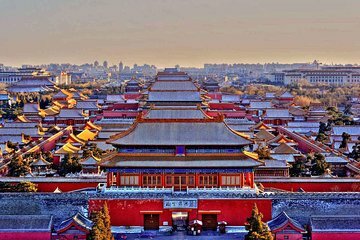 Promenez-vous sur la place Tiananmen, explorez la Cité Interdite, qui a abrité les empereurs chinois pendant des siècles, puis promenez-vous sur la Grande Muraille à Mutianyu. En chemin, savourez un déjeuner chinois, visitez un atelier de sculpture de jade et découvrez la médecine traditionnelle chinoise. Votre journée comprend des transferts aller-retour et un guide. The tour guide and bus arrived promptly at our hotel and we were quickly taken to the Forbidden City in the bitter winter cold. After a short wait for the attraction to open we were guided through, stopping along the way for important pieces of information. Our guide, Tina, was kind enough to ensure that we only stood still in the sun so as to not freeze any more than we already were. After the Forbidden City, we took the warm bus to a Jade salesroom. We did not feel pressured to purchase anything. Next stop was the lunch at the foot of Mutianyu following about an hour drive. The lunch was yum cha style and was suitable for the ten people on the trip. The cable car is at your own cost and we were given two hours to explore which was just enough time to experience it but if you were hoping to walk to the top then you would need some more time. On the way back, we stopped at a tea house and taste tested five teas. While that experience was pleasant, we were not interested in buying any teas at extremely inflated prices. Overall, this was an excellent tour and Tina was a wonderful guide with very good English. I would recommend this to anyone hoping to see two of Beijing's main attractions in one day.